And we are at this time of the year where you either write the year in review or make up some horoscope. Or both. Safely I prefer to limit myself to a horoscope, as seriously as one can make such predictions considering the nature of the beast. 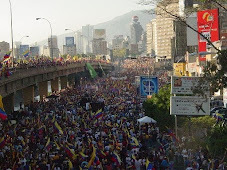 2010 is going to be a very difficult year for Venezuela. To understand this better we need a quick overview of the actual political and economical situations. The first thing that one must understand is that unless the government decides to make a dramatic change in the way it is running the economic ship, next year is going to be worse, maybe much worse, than 2009. Unfortunately it is very unlikely that anything will change as the only governmental plan is to wait for a significant increase in oil prices, something that will happen at best late in 2010, too late to have any positive electoral effect before the crucial parliamentary vote of September. The basic problem of the economy is that the private sector has been reduced, even dramatically in the area of goods production. Currently there is no trust in governmental policies, there is little spare cash for investment and even less taste to invest. In addition the fixed currency exchange rate favors an economy of importations over local production, a convenient tool for chavismo to direct goods to their followers. In other words the private sector is simply unable and unwilling to pick up the slack and try to help a revival of the economy. That would be difficult even if there was a will because with a fixed currency, an inflation rate of 30% and punitive labor laws the private sector simply can do little better than fight for its survival. Forget about job creation: even the financial sector and the import and distribution sector are very unlikely to grow significantly in 2010 because there is less money to go around unless the government continues increasing the country's debt at a scary rate. Forget about the public sector. With the recent electricity and water crisis it has shown its total incompetence. Add to it the recent corrupt banking crisis and you can figure by yourself that those in charge of the public sector economic activities are in for a quick buck at state expense, way more worried about proving their loyalty to the regime, while lining their pockets, than to produce anything of value. Incompetence and political greed explains also the dramatic collapse of steel production in Guyana since the government took over SIDOR. Reports of equal drop in production and quality are heard from the nationalized cement industry. The forecast is dim: I predict an increase in joblessness and at least 20% inflation for the first semester. I also predict that the recession will go through at least the first two quarters independently of oil prices variation. I also predict that the government will either have to increase gas prices or devaluate the currency to at least 3 Bs. to the USD from 2.15. These will have little effect on the current crisis except for exacerbating inflation in the second semester. The economic problems of the country are due much more to the legal and coercive repressive system coupled to corruption than to gas or dollar price. What is needed is to restore confidence and this is not going to happen. With the economic problems, the fast deterioration of services and the now 11+ years of Chavez rule, it is very difficult to see what novelty can Chavez come up with to improve his numbers again and obtain the electoral victories he will need this year. In fact the measures taken by the regime in the past month show clearly how conscious of its weaknesses it is, at home as well as abroad. In spite of the reelection of Evo Morales (never in doubt, more about that in a later post), the fact of the matter is that 2009 has been a very bad year for Chavez. If the Honduras fiasco is the more visible sign of Chavez retreat, other signs abound, from and increasing lukewarm Correa in Ecuador to a possible change in the relationship with Argentina and Brazil next year as the new Congressional Majority in Buenos Aires will start to play while the succession of Lula will become a concern for Chavez. That is what explains why Chavez spent so much time going to Copenhagen just to try to recruit to his cause the violent protesters at the summit. His incoherent and shameless ploy (he presides the country with the lowest gas prices of the world and the least emission controls of the lot) will probably not work much to rally the radical leftist crowds whose support he seeks. Times are changing fast and Chavez is looking everyday more like the past than the future. Hence his recent international vehemence. My prediction here is that through 2010 Chavez is going to be increasingly isolated and thus increasingly dangerous. The rate of the process will depend on many things, from the victory of Piñera in Chile to the difficult wished for victory for Roussef in Brazil. Never mind the ever possible death of Castro. Thus a permanent but larval conflict is to be expected on the Colombian border while Venezuela will be increasingly difficult inside the OAS. Two ways to make sure Chavez remains in the news. Things are not much better at home. Chavez numbers have been going down together with the economic numbers, except that the time factor is also playing against him: after 11 years more and more of Chavez supporters are simply going to get tired enough to stay home, a universal rule of politics. That is, a slight economic recovery this time will not be enough to secure a vote majority. There are also much graver problems for Chavez. In spite of all of his histrionic skills he is not able to fully deflect the responsibility for the current problems as well as he used to do. Namely I have in mind the corruption issues which are on the forefront of the news, and the speedy decay of public services, from health to electricity supply. The problem here for Chavez is that ten years of neglect cannot be fixed in a few months even if oil prices were miraculously to reach 100 USD on January 1st 2010. Chavez is starting to have an image problem among his less committed supporters who clearly see that he is unable to put competent people in charge. The Teflon is wearing up some. Considering that the opposition is for the first time making some organizational progress and standing to benefit from the situation Chavez has embarked on his only option left: repression, and a mean nasty one at that. The obvious evidence of this new harsh line comes from the refusal of Chavez to grant Christmas pardons to even a single of his political prisoners, people that have made no crime when compared to the real crimes that Chavez made in 1992 and for which he was spared trial anyway. You need to go no further to taste the hate within chavismo than to observe this lack of clemency. But the repressive nature of 2010 is heralded on many other ways, from a new list of people banned from running for office next year, to a radicalization of the electoral board, CNE, whose new two members are radical followers of Chavez and thus certainly willing and able to cheat to make sure their man does not lose elections through 2010. Add to this further measures such as the intervention of cable services to force local cable only networks to pass Chavez cadenas. This is not only an implicit admission of chavismo failure in the open media, but it is also a stupid measure that will cost chavismo more than what it can bring in support. Until now cable only netwroks were spared the obligation of cadenas. You only need to observe the proliferation of satellite dishes in poor neighborhoods to realize that this popular segment is going to resent Chavez interrupting their hard paid soap operas on cable. In other words, chavismo knows that next year elections will be lost and it is creating fast a legal system to muzzle opposition and reverse the trend, or allow for a cheating that cannot be properly reported. The prediction here is easy: expect more measures to limit individual and economical liberties, to make sure that the opposition campaign will be as handicapped as possible, and that no one will dare finance the campaigns in fear of an unjust but "legal" crackdown in their business. A prediction becomes thus very difficult: I can predict that in September the opposition will win in spite of every obstacle, BUT I cannot predict whether there will be an election in September. Is all of these grief really necessary? The reader that followed up to this point will be very justified in wondering if all of this nastiness is really necessary. The answer paradoxically is yes. The superficial explanation is that we are in the XXI century and thus Chavez needs to find a way for the people to give in and vote willingly his permanent regime until he dies. Chavez retrograde mind to the caudillos of the XIX century is still able to understand that we are not in the XIX century anymore. But there is a deeper explanation to all this. Since 2003 Chavez has given the upper hand to the Cuban advisers that now surround every aspect of Venezuelan administration. We must understand that at some point in recent years for all practical purposes Venezuela has become a colony of Cuba, exploited with the same intensity as colonial powers exploited Africa or Asia as recently as the 1960ies. This crime against the nation will bring Chavez to jail eventually, or at least excoriate his memory in history books, but for the time being we need to understand the implied meaning of this reality. Cuba and Chavez are seeing the political opposition as an independence movement of sorts, which should be repressed but not in a scandalous way (remember that large scale repression in the European colonies was rather a rare occurrence, and as much as possible disguised under military operations against some enemy attack or something of the like). As Elizabeth Burgos wrote in the most recent issue of Zeta (not on line) Cuba has no interest in destroying further Venezuela economic potential because it needs the revenue. What Cuba wants is control of the country. As such Cubans and Chavez have allowed all sorts of cipayos (sepoy) to take root in the Venezuelan administration, from corrupt officials, corrupted either through power or payment, to a class of nouveau riche who are likely to favor business to Cuba as a payment for their new riches. Not forgetting the military nature of the regime increasingly tied to Cuban "advisers", a military establishment that has betrayed all of its constitutional functions by choosing to become fat, lazy and repressive as needed. It is thus important that the political opposition starts understanding that its political actions must go now beyond the expected political discourse of an independent country: now the opposition must prepare itself for a new kind of independence war, with all the violence and repression that this idea carries. As long as the opposition does not understand that, or at least does not speak clearly to the country about that I predict that the chavista cipayos will hold power for a while more. So Newsweek predicts the end of Chavez this year. I wouldn't have even known if Chavez hadn't gotten so upset.